Flowers have been used to send messages and express emotions since ancient times. In the Victorian era, lovers would send messages coded in blooms to express feelings which could not be spoken aloud in Victorian society. 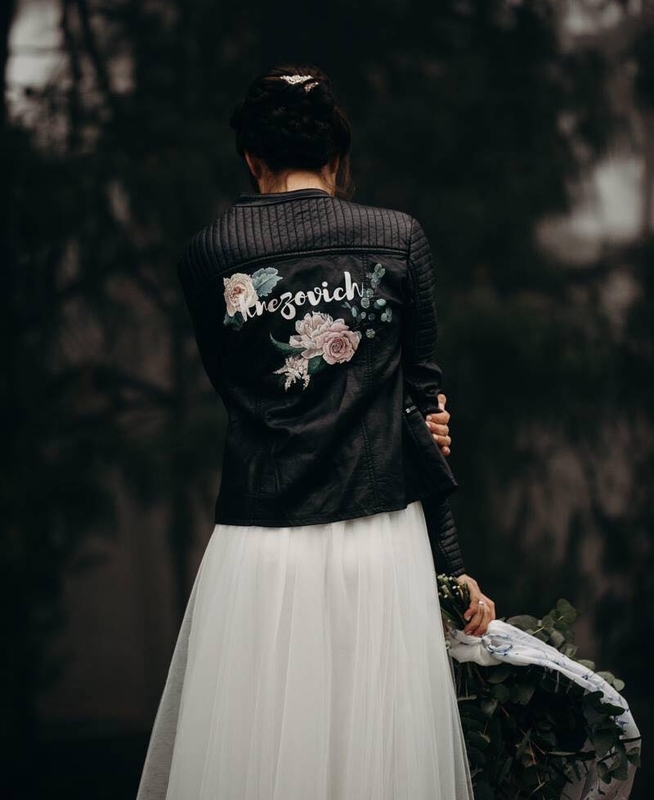 I love using floral symbolism in my work, and every hand painted jacket includes carefully selected florals to capture emotions and symbolism which speaks to my client’s personality and the occasion for which the jacket is to be worn. In Rhiannon’s wedding jacket (pictured alongside) I used florals to match her bouquet. We chose roses to symbolize love, peonies for romance and astilbe for devotion to a loved one. Every jacket also incorporates wording selected by the client, as well as florals or colour tones of their choice. OH MY WORD!!! I am obsessed... I did a little dance... Thank u so much. Once you've emailed me with your requirements I will give you a quote. If you're happy to go ahead then we would discuss size, wording and botanicals and then I will start with your jacket. You can either provide the jacket or we will use one of our high quality vegan leather jackets. A 50% non returnable payment is required upfront so we can book you into my schedule and the rest to be paid in full before we ship to you. I use high quality acrylic based paints which are flexible and hard wearing. As long as you look after your jacket (gentle hand rinse or wipe with a damp cloth only) the design should last for years to come. DO YOU PAINT ANYTHING OTHER THAN BOTANICALS? It depends what ideas you have and as long as it's in keeping with my aesthetic and style. The lead time for a jacket is currently six weeks so please book in advance. However if it is an emergency get in touch and we can make a plan! Yes I ship worldwide! Postage costs may vary and I cannot be held responsible for shipping charges.